We’d love your help. 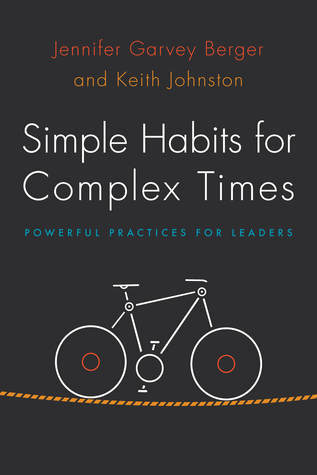 Let us know what’s wrong with this preview of Simple Habits for Complex Times by Jennifer Garvey Berger. Rather than offering one-s When faced with complex challenges or uncertain outcomes, many leaders believe that if they are smart enough, work hard enough, or turn to the best management tools, they will be able to find the right answer, predict and plan for the future, and break down tasks to produce controllable results. But what are leaders to do when this isn't the case? To ask other readers questions about Simple Habits for Complex Times, please sign up. This review has been hidden because it contains spoilers. To view it, click here. Some good take-aways, some repeat material. - Complicated: A problem that you can think and reason about and come up with a solution. E.g., designing a software system. - Complex: Some systems are so hard to reason about that you can't plan or really predict the future. Examples: human systems (orgs), weather, health. - Orgs and businesses are often complex (not complicated). Just recognizing that is powerful, because it means that we shouldn't expect to have clear goals and reach Some good take-aways, some repeat material. - Orgs and businesses are often complex (not complicated). Just recognizing that is powerful, because it means that we shouldn't expect to have clear goals and reach them linearly. - How to deal with it? -- Think hard about your vision of where you want to be. -- Set up "safe to fail" experiments where you try different things and see how the system reacts. Repeat material: biases such as confirmation bias; grow your leaders. A practical guide for acting as a leader in increasingly complex environments. Effective storytelling, and tactics that connect very well to what I see day-to-day in my organizational development work. A really good choice if you're eager to get bored. This is a great book for thinking about organizational complexity. I found the narrative story that runs through it cheesy, but effective. This insightful and very readable book is a must-read for modern leaders. Feels like recommended reading for REAL, what with the constant references to VUCA. Got to stop picking up business and leadership books for the immediate future, they are really boring ._. Leadership, is by definition, about taking people and ideas to new places. -Am I opening to explore or narrowing to decide? -Am I dealing with a threat or an opportunity? In a complex system, paying attention to the inclinations of the Feels like recommended reading for REAL, what with the constant references to VUCA. In a complex system, paying attention to the inclinations of the current situation is key. Understand the system by conducting safe-to-fail experiments. A lot of organisations talk about learning but reward perfection and uncertainty, which is counter-productive. The human brain has an enormous capacity not only to not see the whole picture but also to not notice that it hasn't seen the whole picture. In a complex world the vision is the place at which the past and future come together in a way that guides peoples' action in the present. Leaders need to take a careful look at the past: at the values, history, cycles of change, and core myths and stories. A vision that isn't carefully tied to the shared history of an organisation is disconcerting for people and risks that there isn't enough to make the organisation familiar to people in the future. When we treat polarities (e.g. short-term vs long-term thinking) as problems to be solved, we tend to oscillate between the two extremes. In the Marshmallow Challenge, the highest towers are built by architects based on sound design principles. The second highest towers are built by children, because they prototype instead of discussing, and they have fun. The general guideline for safe-to-fail experiments is that there must be several of these experiments running in parallel so that info-gathering can be simultaneous. More importantly, some of the experiments should contradict each other, so that one can cast as wide a net as possible. As long as you're dealing in a space that is relatively predictable, painting a clear picture of the future is still the most helpful and inspiring thing you can do. Making complexity practical part 2.